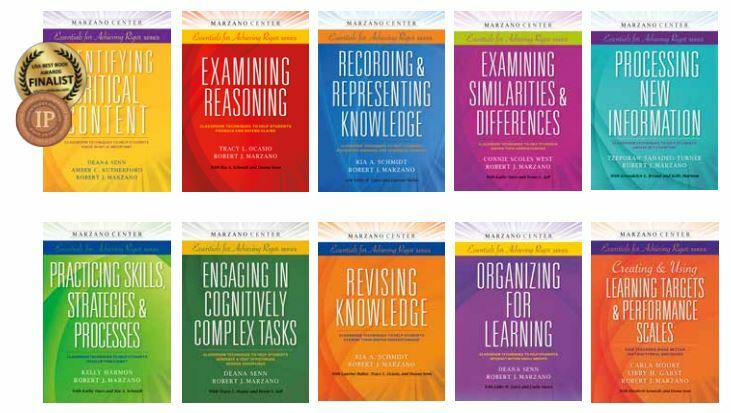 ​Learning Sciences International has launched the Marzano Center Essentials for Achieving Rigor series, designed to help teachers develop expertise on essential strategies that move students toward the higherorder thinking skills required by today’s college and career readiness standards. Authored by Dr. Robert J. Marzano and his team of highly skilled education experts from the Marzano Center, the first books in the series were released in 2014, with more on the horizon in 2015. Educators are looking for practical ways to effectively teach to rigorous college and career readiness standards, such as Common Core State Standards and other state or district standards. Each book in the Essentials for Achieving Rigor series provides explicit techniques to implement and then monitor a critical instructional strategy aligned with anchor standards, along with recommendations for adapting lessons to ensure that all students understand the content. schools and districts trying to align instruction to meet the challenges of increasingly rigorous academic standards. Students need to be able to understand learning goals embedded in performance scales and be capable of generating their own learning scales. This guide explores how teachers can provide rigorous learning goals to meet students’ needs and help them understand and generate performance scales. To meet rigorous standards, students need to be able to engage and reflect on learning in groups. This guide explores explicit techniques for helping students actively process content in partner discussions, cooperative projects, and peer response grouping. Can your students process and respond to information quickly? This book provides explicit steps for teaching students to use new knowledge and processes swiftly and accurately and strategies to avoid making common mistakes. Students must know how to investigate, experiment, and solve problems. This book explores techniques to teach students to generate and test hypotheses. Students must know how to retrieve critical information and comprehend key features of the content. This book helps teachers strategically impart the skills students need to authentically engage with content so they can effectively process the learning and store it for future use. As students work to deepen their own understanding of content, they are continually revising their knowledge. With this instructional guide, teachers learn how to help students revise their knowledge deliberately, using visual tools, written work, and academic notebooks. This guide provides explicit steps, examples, and adaptations to help educators effectively teach students how to examine similarities and differences. Students need to be able to determine which content is critical, why it is important, how it connects to their existing knowledge, and when it will inform their future learning. This book explores techniques for mastering a crucial strategy—teaching students the skill of identifying critical content.